This week we are taking a look at some recent works from artists around the world centered on immigration. Following last week’s writing on Borders, Enclosures, Walls, we will continue in the direction of the movement of people – immigration. People have always moved; it is what has given us our unique and beautiful differences in appearances and cultures! In today’s highly globalized world, however, it is now more difficult for people to move from one place to another than ever before. There are many components at work with this issue (employment, housing, education, health care, environmental resources, etc. ), so the topic can be very complex and emotionally charged for many. Over the past couple weeks we’ve come across some paintings that address this topic. Have a look and see what these images may bring up in your own thinking! What Goes Around Comes Around by Polish artist, Sepe, portrays Portugal’s history of colonialism to it’a current citizen emigration issue. Once an empire benefiting from the taking of land, resources and people from around the world, Portugal is now seeing its citizens emigrating to other countries in search of jobs and a decent life. Sepe’s timeline-like work serves as a historical archive, chronicling past to present. “The protector of emigrants and illegal aliens – The protector of emigrants – This is a shout to all the people around the world who risk their lives every day trying to cross the borders in every way possible, the illusion of finding a better life for themselves and their families. This is … a silent scream of anger for all the people sitting on the chairs of power that do absolutely nothing to solve these problems and are only able to protect their interests and profits, instead of protecting the people. Painted in Southern Italy in collaboration with Project Viavai Racale, Salento, Puglia. The South of Italy is one of the main “doors” for illegal immigrants to enter Europe. 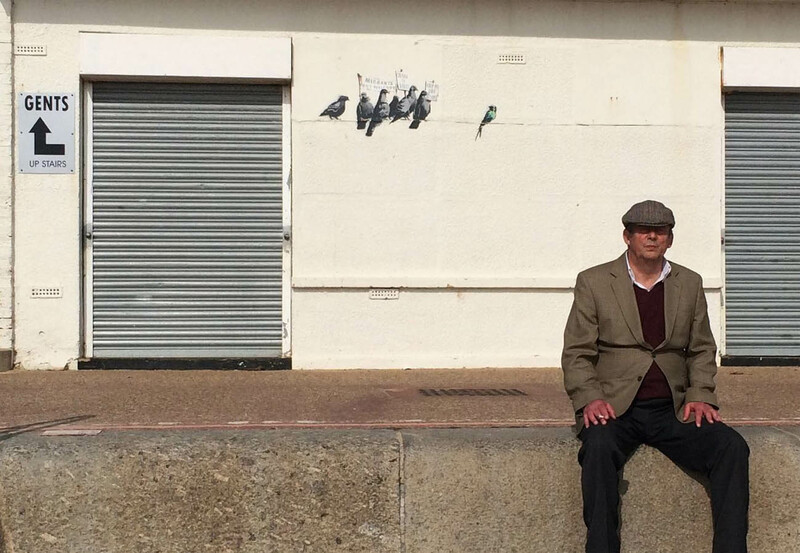 I’ll wrap up this post with a new piece by British stencil artist, Banksy. 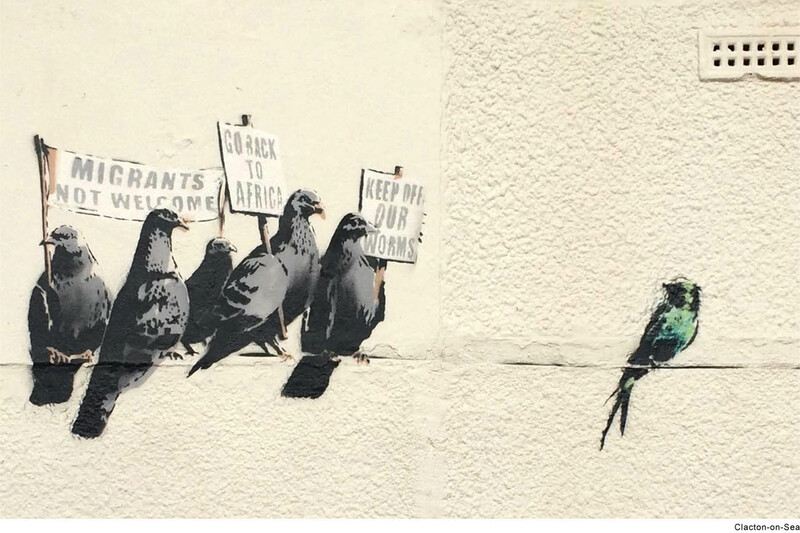 In classic Banksy fashion, the work is cut down and simplified to the bare essentials, while conveying a powerful message about UK immigration issues and holding up a mirror to society.